When we pass away, we leave our lives behind us: services we’ve done for others, friendships forged, and years full of memories with the people we love. Unfortunately, we also leave the tangible reminders of these experiences, and it’s the people we love most who must sort through years of memorabilia, outdated appliances, and broken heirloom furniture. Daughters and sons, spouses, and dear friends must stifle their grief to sort through storage facilities, boxes in the attic, and junk around the house. Hoarding useless stuff doesn’t just limit our home spaces and accumulate dust and mildew, it also provides painful reminders to those we love after we’re gone. People tend to think life goes on indefinitely. They accumulate years worth of junk and never consider that, when they pass away, their grieving loved ones must sort, organize, and haul away their accumulated stuff. Mr Junk frequently has customers who travel long distances to help elderly parents clean out homes after the death of a beloved spouse. Other family members carry the burden alone, sorting through years of shared memories mixed with clunky, useless stuff. The loved ones left behind must organize and prioritize during an already difficult time before they can move forward and say goodbye. If you have cluttered closets and cramped crawl spaces, don’t wait to clean it out until its too late. Ask your kids, spouse, and close friends to help you clean out your home storage. By sorting furniture, heirlooms, and souvenirs together, you make the cleaning process more efficient and less painful in the future. Enlisting friends and family to help clean out your home storage makes the process more enjoyable and efficient. Cleaning out the garage or attic with your kids lets you know which family heirlooms and childhood memorabilia they cherish. When you sort storage junk with the people you love, you have the opportunity to share the meaning behind personal keepsakes. Don’t let years of clutter swallow the time you have with the people you love. After you sort through your stuff, call Mr Junk to haul your junk. 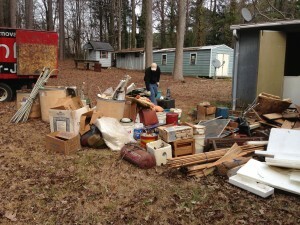 We’ll haul, sweep, and donate your junk so that you can focus on creating new memories with the people you love.